A nephrostomy is a surgical procedure by which a tube, stent, or catheter is inserted through the skin and into the kidney. The ureter is the fibromuscular tube that carries urine from the kidney to the bladder. When this tube is blocked, urine backs up into the kidney. Serious, irreversible kidney damage can occur because of this backflow of urine. Infection is also a common consequence in this stagnant urine. The ureter is blocked by a kidney stone. The ureter is blocked by a tumor. There is a hole in the ureter or bladder and urine is leaking into the body. As a diagnostic procedure to assess kidney anatomy. As a diagnostic procedure to assess kidney function. For unknown reasons, the number of people in the United States with kidney and ureter stones has been increasing over the past 20 years. White Americans are more prone to develop kidney stones than African Americans. Stones occur more frequently in men. The condition strikes most typically between the ages of 20 and 40. Once a person gets more than one stone, others are likely to develop. Upper tract tumors develop in the renal pelvis (tissue in the kidneys that collects urine) and in the ureters. These cancers account for less than 1% of cancers of the reproductive and urinary systems. Upper tract tumors are often associated with bladder cancer. First, the patient is given an anesthetic to numb the area where the catheter will be inserted. The doctor then inserts a needle into the kidney. There are several imaging technologies such as ultrasound and computed tomography (CT) that are used to help the doctor guide the needle into the correct place. Next, a fine guide wire follows the needle. The catheter, which is about the same diameter as IV (intravenous) tubing, follows the guide wire to its proper location. The catheter is then connected to a bag outside the body that collects the urine. The catheter and bag are secured so that the catheter will not pull out. The procedure usually takes one to two hours. Either the day before or the day of the nephrostomy, blood samples are taken. Other diagnostic tests done before the procedure may vary, depending on why the nephrostomy is being done, but the patient may have a CT scan or ultrasound to help the treating physician locate the blockage. Patients should not eat for eight hours before a nephrostomy. On the day of the procedure, the patient will have an IV line placed in a vein in the arm. Through this line, the patient will receive antibiotics to prevent infection, medication for pain, and fluids. The IV line will remain in place after the procedure for at least several hours, and often longer. People preparing for a nephrostomy should review with their doctor all the medications they are taking. People taking anticoagulants (blood thinners such as Coumadin) may need to stop their medication. People taking metformin (Glucophage) may need to stop taking the medication for several days before and after nephrostomy. Diabetics should discuss modifying their insulin dose because fasting is required before the procedure. Outpatients are usually expected to stay in the clinic or hospital for eight to 12 hours after the procedure to make sure the nephrostomy tube is functioning properly. They should plan to have someone drive them home and stay with them for at least the first 24 hours after the procedure. Inpatients may stay in the hospital several days. Generally, people feel sore where the catheter is inserted for about a week to 10 days. Care of the nephrostomy tube is important. It is located on the patient’s back, so it may be necessary to have someone help with its care. The nephrostomy tube should be kept dry and protected from water when taking showers. The skin around it should be kept clean, and the dressing over the area changed frequently. It is the main part of the urine drainage system, and it should be treated very carefully to prevent bacteria and other germs from entering the system. If any germs get into the tubing, they can easily cause a kidney infection. The drainage bag should not be allowed to drag on the floor. If the bag should accidentally be cut or begin to leak, it must be changed immediately. It is not recommended to place the drainage bag in a plastic bag if it leaks. 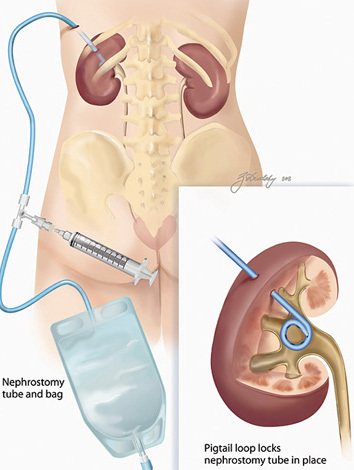 In a successful nephrostomy, the catheter is inserted, and urine drains into the collection bag. How long the catheter stays in place depends on the reason for its insertion. In people with pelvic cancer or bladder cancer where the ureter is blocked by a tumor, the catheter will stay in place until the tumor is surgically removed. If the cancer is inoperable, the catheter may have to stay in place for the rest of the patient’s life. The mortality rate of nephrostomies is of the order of less than 0.05% and the incidence of the specific complications listed above ranges between less than 0.05% (hemorrhage, kidney arterial blocking, and loss of kidney tissue) to less than 1% (injury to surrounding organs and septicemia). In the treatment of ureter stones, extracorporeal shock wave lithotripsy (ESWL) has been most widely performed and has become the preferred treatment for this condition. ESWL is a new technique that offers an alternative to surgery for patients with kidney or ureter stones. ESWL works by pulverizing the stones into sand-like particles that can be excreted with little or no pain. This is achieved by the ESWL procedure approximately 90% of the time. The shock waves are a form of high-energy pressure that can travel in air or water. When generated outside the body, they pass through the tissues of the body without damaging them, but can destroy a stone inside a kidney or urethra. The shock waves pass through both without injury. A stone has a greater density and, when the shock wave hits it, the waves scatter and break it up.